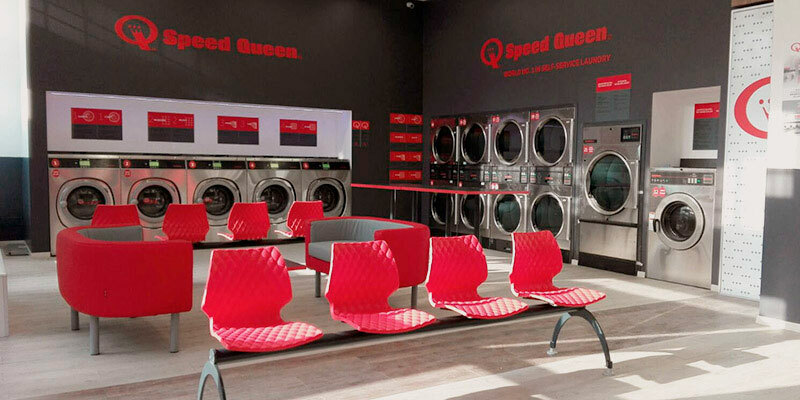 More than simply provision of a service, the Speed Queen laundromat concept is a true partnership. We bring your laundromat project to life. From the first outline to the grand opening, we are at your side. Speed Queen’s experts guide you in the choice of premises, help you design the set-up of the facilities, assist you to prepare the business plan. Thanks to the Alliance Laundry Systems financial arm, we even can, if needed, offer you financing. Note: Naturally, we also take care of equipping your laundromat! We can also help you to modernize your laundromat and equip it with the best machines on the market. Opting for Speed ​​Queen professional washing machines reduces your running costs, maintenance costs and downtime. Our state-of-the-art equipment, the sleek modern design of the Speed ​​Queen concept, all contribute to customer satisfaction and thus customer loyalty. You will have virtually no labor costs. Speed ​​Queen’s state-of-the-art washing machine technology allows for complete remote management, reducing the need for a laundromat presence. Laundromat modules also offer unprecedented flexibility as they can be moved within the space of a few days. Note: Space saving, the modular format is ideal for installation in supermarkets or high-traffic malls.